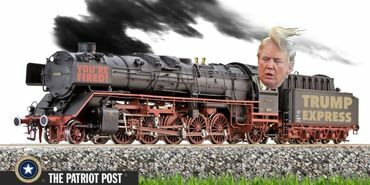 There’s a train coming down the track, a gravy train, and it’s filled with holiday treats for the Trumps, the Kochs, the Mercers, the Adelsons and lots of other GOP billionaires. For you, me and over 90 percent of Americans it’s like inserting my artificial leg in your southern exposure. Only Republicans can stop it, so here is a preview of which ones might. Noted. One can hope! Thx for sharing TC. RESIST! Well, none of them is mine, nor am I on any of their mailing lists. So I guess I'll just keep on signing the generalized letters and petitions which I have been getting notice of. WE THE PEOPLE are the ones who can derail this gravy train! Contact your Senators and keep bugging them. Remind those reps who voted for it that they are up for re-election next year, and they had better listen to the majority of their voters. Keep signing petitions, sending messages and postcards - and remember to vote! That is the most important thing we can do, as that could be the last chance we have to turn our country around - by legal, peaceful means anyway. We can only hope. And pray. I hope they vote against it. Thank you TC. Bahhh may they drown in their gravy!!! .... except for Bob Corker, John McCain & Jeff Flake! Noted, forwarded and shared ultra-liberally across four networks!!!!RESIST! !Thanks for sharing, TomCat!! I got an e-mail from GOP Rep. Bilks, in Florida, where I have a property. He waxed POUD of his idiot vote for the house version. Nelson will vote with the Dems, Rubio, like Bilrakis, is a lost cause. One of them is mine, Rand Paul, who knows how he will actually vote? It'll be uphill...but it can be done! Fortunately, my senators are Dems and will vote against this bill. However, we still don't have enough of the GOP who can't get it through their heads that giving more money to the rich never works for the working class. Even the rich admit they won't use the extra money to hire or improve what they have, they will just keep it. If they won't believe the people they want the money for, then they aren't going to believe anyone else. Thanks for the post, TomCat. Right Sheila, - trickle down is actually fickle promises. Even if the trickle happens, the drip is exceedingly slow and tedious, seldom helping those who need it now. Thanks, stares and tired hugs to all. Let’s hope that at least 5 of these Republican senators will be burrs under the Republican saddle!! !